Tablets aren’t usually considered the best productivity devices but Samsung has done a good job with its newest tablet. 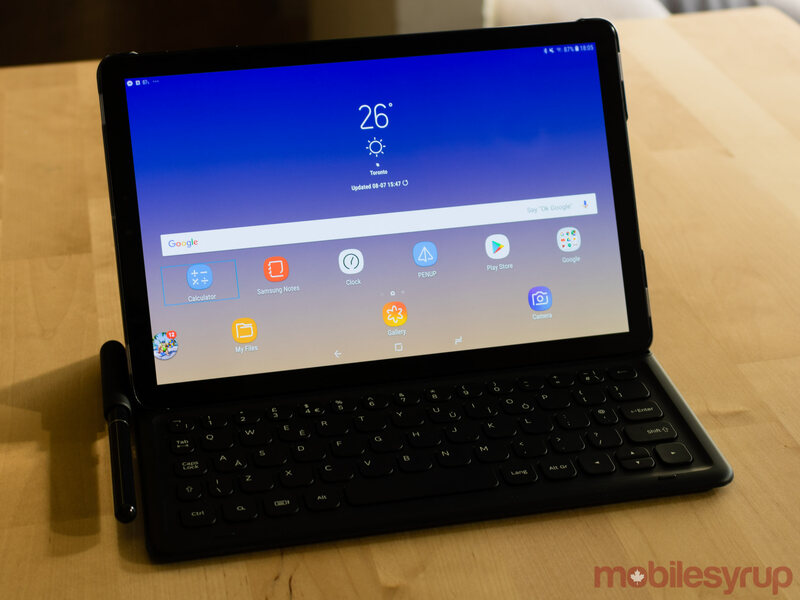 When Samsung unveiled the Galaxy Tab S4 productivity was the factor it chose to highlight and while a person could be productive with the company’s previous Galaxy Tab S3 tablet, with Samsung DeX on board, the Tab S4 can go much further. 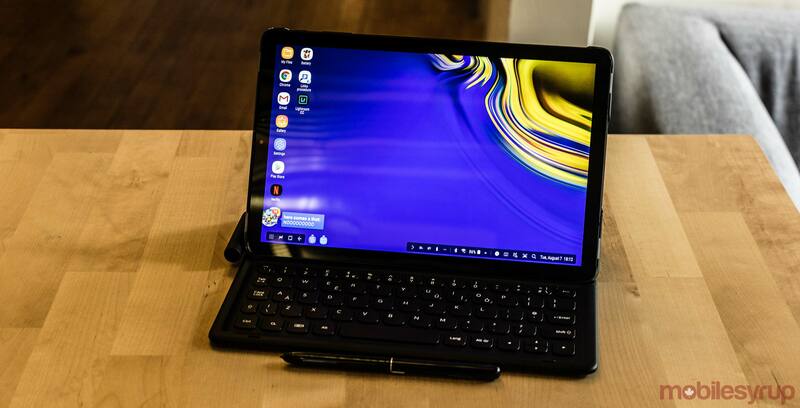 The DeX Desktop is a feature available on the Tab S4 — and other Samsung devices like the Galaxy Note 8 and the Galaxy S9 (though they require the DeX Dock) — that allows the company’s Android-powered devices to function like a Windows laptop. Each application opens like a window, allowing users to multitask better than they would on a smartphone or other Android tablet. 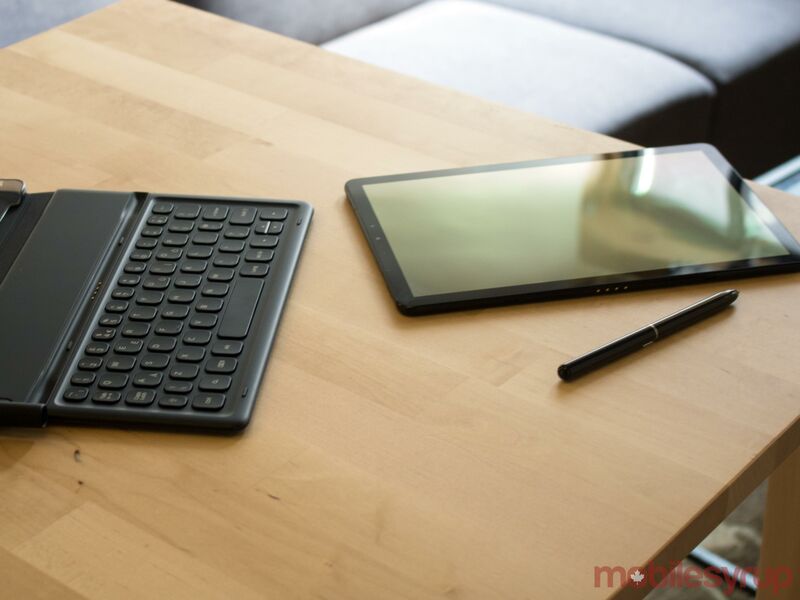 The Samsung Tab S4 is comparable to Apple’s iPad Pro (2017) and Microsoft’s Surface Go, though they feature several key differences between them. 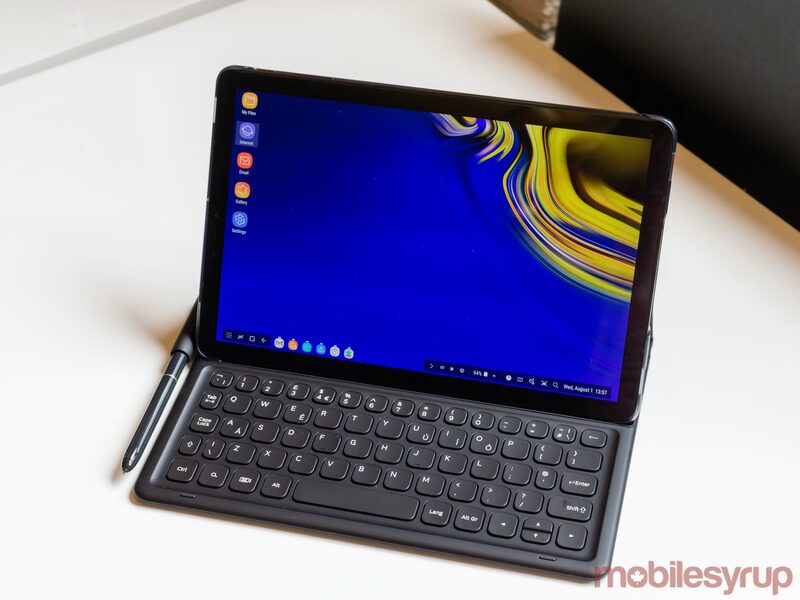 For starters, out of the trio of laptop-tablet hybrids, the Samsung Tab S4 is the only one that comes with a stylus out-of-the-box. Appearance is another of one of the bigger differences between the three. Compared to Microsoft and Apple’s offerings, the Tab S4 features smaller bezels surrounding its 10.5-inch display. Samsung reduced the bezel by getting rid of the navigation buttons found on previous Tab S tablets. Apple’s iPad Pro comes in 10.5-inch and 12.9-inch variants, while the Surface Go, the smallest of the three, only has a display size of 10 inches. Despite its size, the Surface Go weighs the most at 522g. The comparable 10.5-inch iPad weighs 469g and the Samsung Galaxy Tab S4 weighs 482g. I was pleasantly surprised with the Tab S4, as I didn’t think I would be able to use the tablet-laptop hybrid as a replacement for my laptop. However, I stand corrected. By plugging in a mouse and using the Tab S4’s Book Cover Keyboard, I was able to work all day long. The Tab S4 allowed me to write articles, listen to music and multitask with apps like Slack, Trello and Google Play Music. However, Windows 10 2-in-1s like the Surface Go can snap two Chrome windows side by side, a feature that both the Tab S4 and the iPad Pro lack — and a functionality that definitely helps my productivity throughout the day. 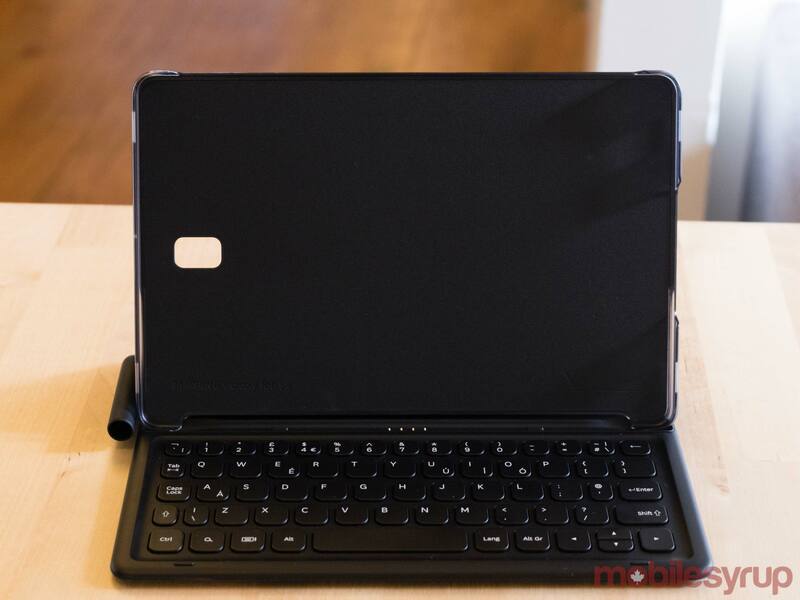 Further, for my average sized hands, the Tab S4’s Book Cover keyboard wasn’t spaced out enough. I found this to be an issue that lowered my productivity, as I mistyped words more often than not. The attachable Microsoft Type Cover keyboard was slightly better than Samsung’s Book Cover because of its trackpad and larger size. However, in terms of pure typing, the two keyboards felt similar. It felt as the key travel on the Type Cover and the Book Cover was nearly indistinguishable, though the keys on Samsung’s Book Cover were more rounded and had a little bounce to them. The Tab S4 felt quick and snappy. It uses an octa-core Snapdragon 835 processor and features 4GB of RAM. In Geekbench 4, the Tab S4 scored 1,854 in the tool’s single-core test and 6,449 in the multi-core test. For perspective, the Google Pixel 2 XL scored 1,775 and 5,884, respectively, while the Samsung Galaxy S8+ scored 1,848 and 6,209. So from a benchmark perspective, the Samsung Galaxy Tab S4 runs more like a 2017 smartphone. I did notice, however, that the Galaxy Tab S4 runs more smoothly and more quickly than the Microsoft Surface Go. There was some lag when I had nearly 15 apps — including YouTube, Google Play Music, Gmail and Facebook — and even more Chrome tabs opened. However, closing some of the apps helped the Tab S4’s speed. The Tab S4 could benefit from more RAM, which would help when running multiple apps and browser tabs. I was impressed with the Tab S4’s battery. With a 7,000mAh battery, I was able to get through an eight-hour-day. When I tested the battery, I started the day with 80 percent battery remaining and wrote articles, used Trello, Slack and listened to music through Google Play Music. I also watched a few YouTube videos, probably equaling up to 20-30 minutes of streamed video content. For comparison, Patrick O’Rouke, who reviewed the iPad Pro for MobileSyrup, found that the Pro can survive up to 10 hours. Meanwhile, Igor Bonifacic found that the Surface Go can survive only for four hours and 10 minutes. 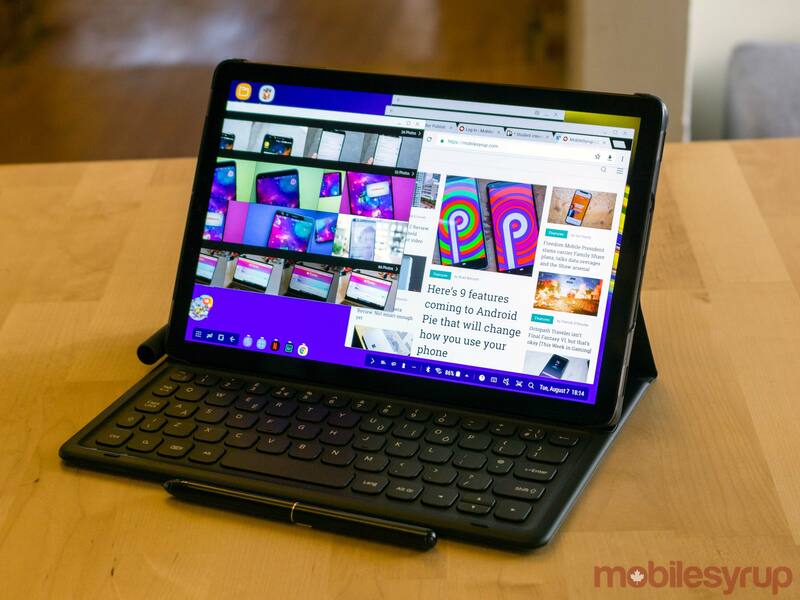 The Tab S4 featured a well-lit display with a 1,600 x 2,560 pixel resolution. The panel showed movies on Netflix with accurate colours, dark shadows and very — almost too bright — highlights. Images on the display looked life-like and were very detailed, helping with my photo editing experience. In terms of its listening experience, the tablet has a full range and is very sturdy with a robust and powerful sound. The volume can also get very loud, enough to fill a bedroom. When watching Netflix movies, and using Dolby Atmos with the device’s four speakers, sound can get lush, rich and full, providing an immersive experience — at least for a tablet. 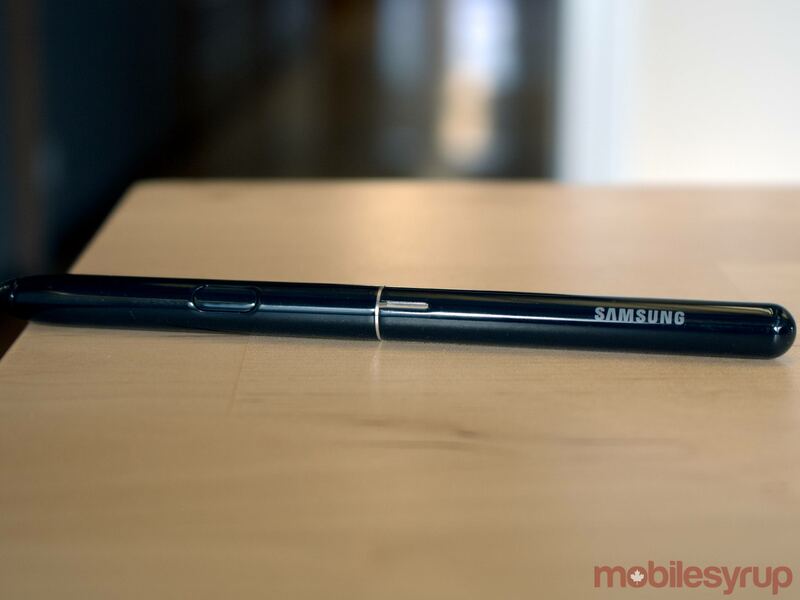 In my time with the Galaxy Tab S4, I only used the S Pen to write a few notes here and there, and to test out the ‘PENUP’ app. Penup is a social media application for artists. It lets them share work they’ve created with people from around the world. Anyone can submit pictures with the PenUp community. The experience with the pen felt smooth and easy to use, with the ability to apply pressure for darker colours, similar to colouring with pencil crayons in real life. The Tab S4 also has facial authentication, allowing users to log into the device with their face. The facial authentication works well, for the most part. However, it’s a little slow. It takes a moment to log on, and once the face is registered, it takes another few moments before the tablet unlocks. The tablet also comes with an iris scanning functionality. However, I found that iris scanning functioned better on the Galaxy S9 smartphone. While using the tablet’s iris scanner, you have to either have to hold the tablet vertically or bring your face close to the tablet while it’s oriented horizontally. ‘Intelligent Scan,’ on the other hand, switches back and forth from iris scanner to facial authentication, attempting to differentiate which is best to use to unlock the device. It seems like Intelligent Scan typically finds facial scanning easier when it comes to authenticating the user. The Tab S4 with 64GB of internal costs $869.99 CAD, while the larger model with 256GB of storage retails at $999.99. An S Pen is included in the box with a Tab S4, while the the Book Cover is not and costs $199.99. The Book Cover felt necessary when using the tablet, unless you connect the Tab S4 to another Bluetooth keyboard. 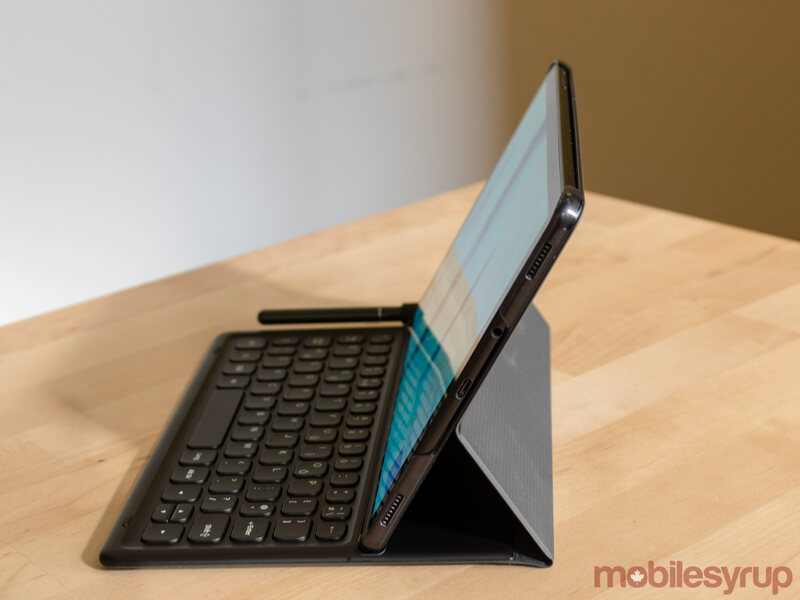 However, the Tab S4 doesn’t have a kickstand which doesn’t allow it to stand up when used with a different Bluetooth keyboard. There’s also a Samsung POGO charging dock which costs $89. The dock charges your Tab S4 and prompts the tablet to display the current time. In comparison, the Microsoft Surface Go costs $529 plus another $169 for the Signature Type Cover — which features a trackpad. Microsoft users can also purchase an optional Surface Pen, which adds another $129.99 to the cost of the 2-in-1 device. Finally, the 64GB iPad Pro starts at $869 CAD, with a $219 Smart Keyboard and a $129 Apple Pencil. With its lightweight design and extensive features, I definitely wished I had the Tab S4 while I was in university. However, starting at $869 plus the $199.99 Book Cover keyboard (there's a $999 bundle with the keyboard, the tablet and the POGO pen) seems too steep for young students. It's also too expensive for a secondary laptop option. So while I enjoyed using my review unit, other 2-in-1s and laptops may be a better option. I can't definitely say it's not worth the money, though I do wish Samsung had bundled in a keyboard. Either way, at least it comes with the stylus -- looking at you Apple and Microsoft. I can't definitely say it's not worth the money, though I do wish Samsung had bundled in a keyboard.